Whether we are facilitating a small brainstorming group, training a large class, or teaching an academic course, we fall susceptible to the “it’s really important to collaborate” practice. What in the world does that mean? Just chat about it? If you are shuddering at the thought of “discussion items” on a meeting agenda as much as I am, we both know it’s not about dropping a topic bomb on the table and seeing where it goes. We can apply best practices to running a meeting, but let’s not confuse that with effective collaboration. Good facilitation management ONLY sets us up for an environment where collaboration can occur. There are a few learning cycles we must feel comfortable applying in order to ensure good outcomes based on a collaborative discussion. Andrea Corney’s compilation of three different learning cycles is a brilliant way to present different learning cycles that can be applied as a framework for facilitating a collaborative experience. 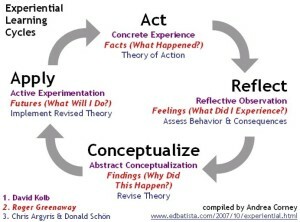 Thus….we find Greenaway’s work on the experiential learning cycle incredibly helpful for the normal discussion. During a faculty training experience I told them that we would use these four questions to explore a frustration they had. So together we worked through what happened, what was experienced, why did it happen, and what actions could we take. (The Agile community calls these ORID’s.) By the way, this is the best possible way to demonstrate models … simply do it. Whenever this has been used, academically or professionally, I have found that tangible actions have been not only achieved, but consensus has either been also achieved or clear parameters have been established within disagreement. Both are important. This is where interdisciplinary methods of learning is so useful. The Lean community may be more familiar with loop learning cycles presented by Argyis and Schon, and it’s important to respect the language and conceptions within fields. The essential value for the theory of action is a method to create strategies for change. Loop learning is integral to their work. In complex environments, this loop learning provides a guide to experimenting in order to find effective actions beyond a specific situation. 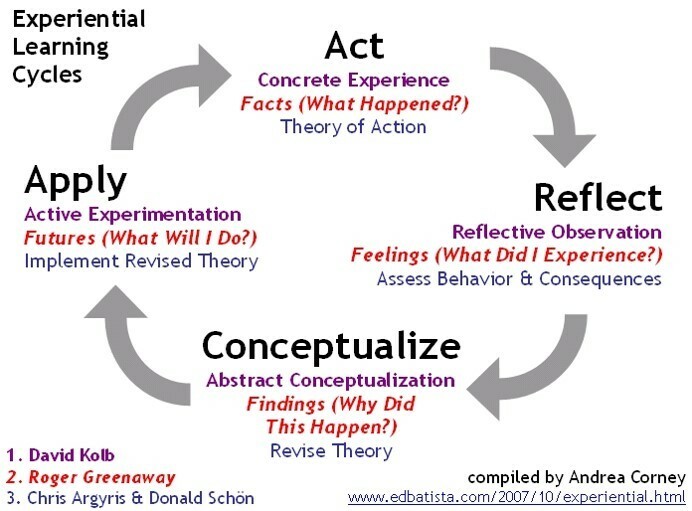 The next time you need action based on collaboration and even, maybe, consensus … or the next time you want to really pull from the experiences of your students and help them create new knowledge, try one of these frameworks, preferably the one that really resonates with your own experiences. Cross posted on LinkedIn: Facilitating Collaboration.